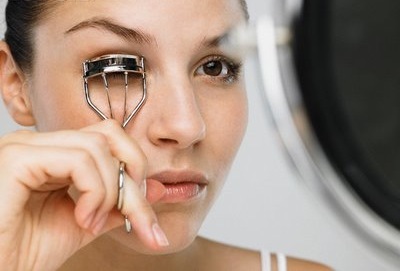 This may be sacrilegious to say as a beauty junkie, but eyelash curlers freak me out. I can probably count on one hand how many times I’ve used one. I always read makeup artists saying “you must!” and “they open up your eyes!” which are both probably true, but still…I have a strange fear that I’ll open the curler up to see my eyes lash-less, my flutterers pulled out by this horrific looking contraption. And heated ones??? Those give me a mental heart attack. Even when I’m doing someone else’s makeup, I will ask them first if they feel more comfortable doing it on themselves, and if not, I can manage getting it done…just very slowly. Anyone feeling me on this? And OK fine, if you’re big on curlers, let me know if you have a fave…just in case I get over being a wimp. loved your blog food every where looks so delicious would definetly try on my next visit to ny good luck with your blog very informative. On curler its use before applying mascara shows amazing results. I completely feel you on this. I have had a fear of said curlers since I first came to know they existed, and that you were meant to use them by sandwiching your thin and frail lashes between their clenching jaws. Ok maybe I’m also going a little overboard, but I flat out do not know how to use one, even though I am in dire need of curling my lashes. They are perhaps best compared to Mr. Snuffleupagus, but I am still waiting for someone to invent another way to curl my lashes, or just do it for me on a regular basis. OMG sabrina, me neither — I mean, I literally learned last summer you use it BEFORE mascara…Miral taught me that when I was doing her makeup trial for her mendhi. I was like…thanks! good to know..err wanna show me? Maybe curling mascara is the way to go. Do they work? hmm next blog idea..
of course!!! especialllllllly when you’re going sans mascara (like windy rainy windy days in chicago). molly gave me the shu umera one for my bday like 2 years ago, and its still going strong. though, i’m only comparing it to the drugstore ones i’ve previously owned. $18-$21 at sephora. I ALWAYS hear about the Shu Uemura one..and really? sans mascara? I don’t see the point! Doesn’t it not stay curled? yes…really. it’s that good. the point is that you don’t want your eyes looking like just-woke-up, but wide-awake…even on days where no mascara is involved. I can’t leave home without curling my lashes, something ive noticed is that, my lashes get weighed down after i put mascara on so i wait until the mascara dries and then curl my lashes, makes them look long and curled and it lasts all day…try it out! Hey lady, love the blog!! I use the Shu Umera as well, but here’s a great trick if you want the heated lashes look without a heated curler, heat it up with your hair dryer for a few seconds, works like a charm! Thanks Mona!! I JUST heard a really scary curler story at the bridal shower as was at yesterday…i’ll ask if i can share in an upcoming post! Pingback: Beauty and the Feast » Blog Archive » Jennifer Fleming beauty tip: shadows first!